Hardware Lifecycle Management is a holistic approach to managing the total useful life of IT hardware to maximize the return on investment. By considering the entire useful life of a server, router, or tape storage library, implementing Hardware Lifecycle Management practices help data centers lower hardware and maintenance costs, increase upgrade flexibility, extend the useful life of its IT hardware, and maximize the value of servers and networking equipment. For IT Directors and Managers, in addition to lowering the total cost of ownership, other benefits include fewer emergencies and predictable control throughout the hardware lifecycle. Comprehensive planning is the foundation of successful IT hardware investment. During the planning stage, the following steps are typically undertaken: A full evaluation of existing IT infrastructure is completed. Any deficiencies or opportunities to extend the infrastructure are identified and addressed. Short and long-term plans are created to maximize the budget and leverage existing data center infrastructure. World Data Products will help you identify opportunities for increased efficiency, business value and growth. We participate in creating a road map of clearly-defined steps that your department can take toward infrastructure improvements. Our IT planning services are backed by thirty years of broad expertise in business consulting and hardware. We can help you outline an approach to investing in the right IT infrastructure at the right time — an approach that aligns your IT strategy to business objectives. Once you have a plan in place for expanding or upgrading your IT hardware infrastructure, your next decision is whether to lease the hardware you need or buy it outright. Regardless of which option you choose, World Data Products will help you secure the best price on the servers, storage, and networking equipment you need. Deployment and installation of new servers, storage, and networking equipment can be complicated and costly for enterprise organizations with multiple installation locations. Partnering with an experienced IT hardware reseller can considerably simplify installation and deployment processes. Reduce the time and costs associated with deploying server, switch, and router installations. Develop preconfigured and custom configurations to streamline installations in the data center. Experienced IT professionals know that there are steps they can take to lower the overall cost of IT hardware maintenance programs. Choosing the right amount of coverage from the right maintenance company can offer you significant savings. World Data Products represents some of the largest, most experienced third-party IT hardware maintenance companies in the industry to provide reliable worldwide hardware maintenance at a fraction of the cost of OEM service contracts. 24x7 or 9x5 on-site hardware maintenance service. 2-hour, 4-hour or next day response times. Customized service levels to increase end user productivity. Control of hardware support costs. Strategic system upgrades can improve the efficiency and longevity of your IT infrastructure. From upgrading an individual system component to overhauling your entire infrastructure, upgrades can be costly and time intensive. Having an IT equipment hardware partner to help during the upgrade process can save your organization time and money. The IT Hardware Specialists at Wold Data Products are experts at helping you identify the right upgrade for your system, sourcing the necessary components, and recommending great cost-effective equipment alternatives that will save you money. We can assist you with hardware and software upgrades. Repairing existing systems and components extends the life of existing IT infrastructure and leverages your IT budget for maximum return on investment. Repairing equipment can offer savings of up to 80% compared to purchasing new equipment, without sacrificing reliability or performance. World Data Products is your one-stop repair shop for leading IT hardware platforms including: Cisco, IBM (iSeries, pSeries, xSeries), Sun, HP (9000, Itanium, Proliant), Dell, and more. Our trained technicians repair network and server components, as well as workstations, printers, and personal computers. All equipment received by our Repair Department undergoes comprehensive physical inspection and diagnostic testing, parts replacement and upgrades as needed, and final testing and quality inspection. 90-day guarantee on all repairs. Extended guarantees available. Trained repair technicians following ISO 9001:2015 quality control standards. Free disposal of non-repairable items. Express Repair Service where all repairs are completed within 5 days. Overnight shipments to anywhere in the world. Replacing legacy equipment on your own can be a challenge and upgrading your entire system before you are ready is expensive and time consuming. Avoid the hassle and expense of a forced upgrade by extending your system through the strategic replacement of key legacy parts. Extending your IT infrastructure in this way results in a better return on your IT hardware investment as well as greater control over how you run your business. Founded in 1987, World Data Products has the knowledge, inventory, and industry relationships to source almost any legacy system or component. We understand the need to extend current systems and support end-of-life equipment for leading hardware manufacturers such as Cisco, Dell, IBM, HP, UCS, and more. World Data Products is your best source for hard-to-find servers, storage, and networking equipment as well as upgrades, repairs, and replacement parts. We routinely buy used Cisco equipment and used servers to maintain our inventory of fans, drives, power supplies, memory, and other critical server and networking parts. The opportunity to sell used servers, networking equipment, and backup tape is a great benefit to data center professionals that want to recycle equipment instead of paying for disposal. 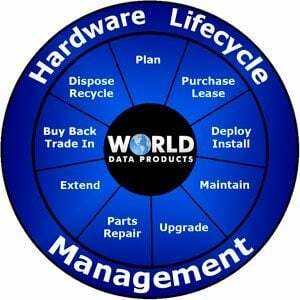 Working with a company like World Data Products, you can rest easy that we will clean up that switch, test all of the functions, make repairs if necessary and recycle it back into the marketplace. You receive a free IT asset evaluation and a fair price offer. Choose payment in cash or opt for trade-in credit. We arrange transportation of the equipment from your location. Equipment and components are refurbished and placed in our inventory. When we buy used networking equipment or server hardware, items that can't be resold will be disposed of in accordance with all Federal, State and Local laws. Disposing of used servers, storage, and networking equipment on your own can be expensive and time consuming. Not only must you comply with federal, state and local electronics disposal laws, you may have to ensure that any sensitive data on your hardware is removed to mitigate any business risks due to data security. World Data Products is an industry leader for IT Asset Disposition (ITAD) services. World Data Products offers hard drive and media destruction services compliant with the 5220.22M Department of Defense standard, HIPAA, the Gramm-Leach-Bliley Act, the Sarbanes-Oxley Act, the Patriot Act, and the Identity Theft and Assumption Deterrence Act. We provide Certificates of Destruction with on-site or off-site data erasure or destruction services. IT hardware that has reached the end of its useful life can be recycled or disposed of in accordance with federal, state, and local environmental laws. IT Asset Disposition (ITAD) services for networking equipment, servers, storage, and wireless products. Optical Media including CDs, DVDs, Blue Rays and HD-DVDs.